An Aboriginal artist whose work has been exhibited in Paris, Santa Fe and Shanghai has given one of Sydney’s most prominent buildings a dramatic makeover. 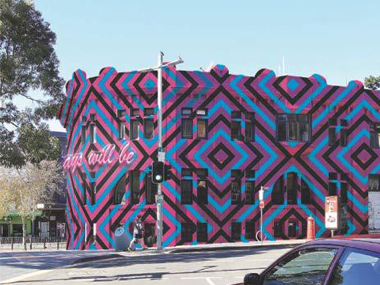 ‘Always was, always will be’, by Reko Rennie, covers the full façade of the T2 building at Taylor Square South with giant geometric diamonds painted in neon pink, black and blue. Launched last week, the new artwork explores what it means to be an urban Aboriginal in contemporary Australian society, with the diamond pattern referencing the traditional markings of the Kamilaroi peoples in north-western NSW. The title of the artwork, which refers to the Gadigal lands upon which T2 sits, will be incorporated across the front of the building in neon text. Rennie is currently installing the artwork on site, with the protective scaffolding set to come down on 18 September – in time for the launch of the City’s annual public art festival, Art & About Sydney. City of Sydney CEO Monica Barone said Taylor Square is one of Sydney’s most iconic public spaces, making it the perfect home for this extraordinary artwork by one of Australia’s most innovative artists. “Reko Rennie’s larger-than-life mural is a fascinating mix of traditional imagery and contemporary techniques, and is bound to be an instant hit with the thousands of people who pass through the area each day,” Barone said. Rennie, a Kamilaroi/Gamilaraay/Gummaroi man, has no formal artistic training, but discovered graffiti as a teenager and has been passionate about the medium ever since. In 2009, he was awarded an Australia Council of the Arts residency at the Cité Internationale des Arts in Paris. His works have since been exhibited in France, Germany, China, Hong Kong, Indonesia, the United States and Australia. Rennie’s artworks and installations explore issues of identity, race, law and justice, land rights, the Stolen Generation and other issues affecting Aboriginal and Torres Strait Islander peoples in contemporary society. “Always was, always will be is a simple but powerful reminder that you're standing on Aboriginal land. This is Gadigal country – it always was, and it always will be,” Rennie said. The first Streetware was held in 2010 as a curated program of temporary street art installations in the City’s laneways, and has since given more than 20 artists the opportunity to exhibit their works in the public domain. Following the launch of Always was, always will be, several smaller artworks will be installed in and around Foley Street in late October as part of this year’s program. All artworks will stay in place until March 2013, when the façade of the T2 building will be stripped and restored to its 1910 face brickwork, as part of its heritage restoration.